When you’re travelling or simply on the go, you don’t want to feel embarrassed by a lost button or a ripped seam. And those cheap dollar-store sewing kits never offer enough to get the job done right. So create your own emergency sewing kit, and you’ll be able to get everything fixed perfectly and yourself back on track. There are some key tools that, if not included in your emergency kit, will make it pretty much useless. The most crucial of these is a pair of mini scissors. And no, those dull, round-tipped ones that you can get at the dollar store don’t count. They should be small, sharp and pointy. Fabric and crafting stores are sure to have several inexpensive pairs for you to choose from. You should also bring a seam ripper (also called a stitch picker) with you. Attempting to pull out fine stitches with scissors can prove impossible — or worse, you could cut through the fabric. Seam rippers come with caps that make them safe and easy to store, so there’s no reason not to include them in your kit! Having the right thread around is key when you want to get something fixed. Ultimately, the more thread you can pack into your kit in an organized fashion, the better! But to keep things neat, just start off with small spools of white, black, brown and grey. You can keep them on bobbins in their own pouch or create your own indented-cardboard winder, like those you see in the dollar store. Whatever keeps your thread from getting into a tangled mess is perfect. Your kit won’t get you very far if you don’t have a needle to work with, so always travel with two, in case one breaks or gets lost. And in order to make your fixes more precise, it is helpful to have some items with you that will hold fabric securely while you work — two or three safety pins and four or five regular pins should do the trick. Just make sure the needles and pins are securely placed in a piece of a fabric or a pincushion, so they don’t tumble around and prick you unexpectedly. A few buttons of different shapes and sizes are always good to have on hand. Stick with neutral tones, such as white and black, since sewing a magenta button on a forest-green blouse will likely do more harm than good. Aim to have some very petite buttons, perfect for blouses, and some larger ones that can handle coats or pants. If you have a little extra room in your kit once everything else has been assembled, don’t be afraid to toss in a dome (snap closure) and clasp or hook-and-eye closure. They are a great back-up if something doesn’t fit correctly or the buttons you have on hand aren’t the right size. Now that you have all that you need, the question becomes, how do you keep it all together? Well, if you’re looking for a fun craft, you can certainly consider making the pouch yourself, tailoring it perfectly to your needs and style. But if you don’t have time or skill for that, any old small makeup pouch or cosmetic bag will do. You can even keep everything in a Ziploc bag or tiny Tupperware container until you find the appropriate device. As long as everything is safely secured in one place, you are good to go. 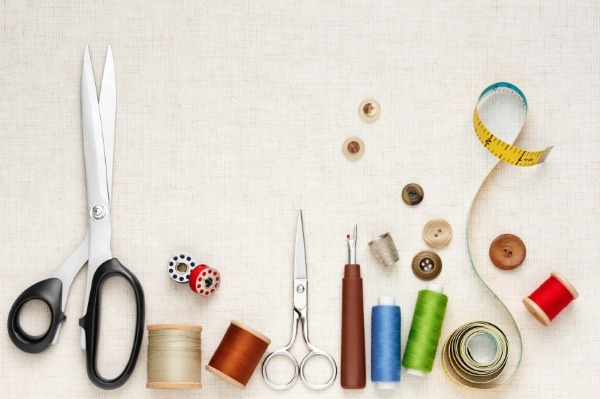 Creating the perfect emergency sewing kit is great — but not having it on hand when you really need it isn’t fun. So make sure you always keep it in a bag that travels with you consistently and store it in a safe compartment where it won’t fall out. If you happen to be flying, don’t forget to put it (or even just the scissors and seam ripper) in your luggage, so nothing gets taken away from you in the security check. If you can keep this little miracle on you at all times, you’ll be able to fix every snag, every time!